Undercover Black Man: Richard Wright gets a stamp. Richard Wright gets a stamp. The U.S. 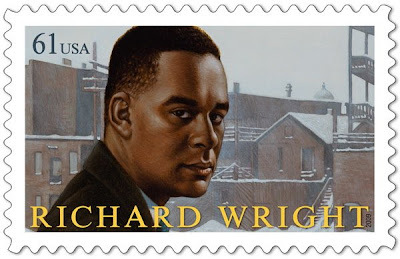 Postal Service today introduced a 61-cent stamp in honor of the novelist Richard Wright. Which reminds me that during 2008, I failed to blog about Wright on the occasion of the centenary of his birth. The RW news just took me back to the classroom. The inside of my Black Boy is almost paper bag brown now. For me, the most memorable scene in BB is when Wright's grandmother is bathing him and he tells her "when you get through, kiss back there." Too bad that my stamp usage is low these days.